If you love Chinese food, take a break from the Manchurian and Chilly Paneer! Try this vegan Chinese dish tonight. It is very easy to prepare and can be done within 15-20 minutes! 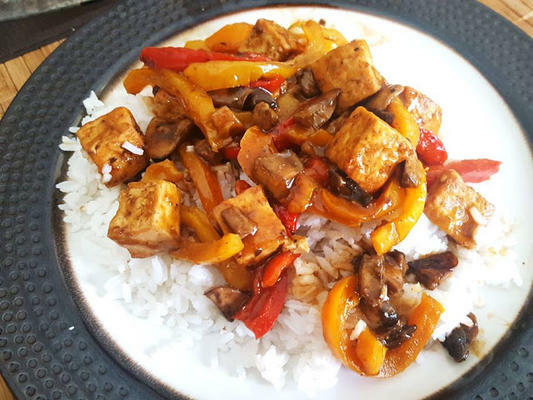 Ingredients: Firm tofu, Finely chopped garlic and ginger, shelled and peeled peanuts, diced onions, diced green and red bell peppers, vegetables of choice, cornflour, soy sauce, vinegar, dried whole red chillies, salt, sugar, spices and oil. Method: To prepare the tofu for this dish, first place it on paper towel and pat dry. Now cut the tofu into one inch pieces and place on a paper towel to dry further. Now in a bowl, mix together cornflour, salt and spices. Put the tofu pieces in this bowl and spread in the dry flour mix to coat all the pieces nicely. In a pan, dry roast the peanuts. Put aside. Now pour some oil in the pan and gently toss in the tofu pieces. Shallow fry the tofu pieces, turning them over every 2-3 minutes. Fry them till they are golden brown. Take out of the pan and put aside. Now in the pan, fry the whole red chillies and take them out. Fry the peanuts and put aside. Now add the chopped ginger and garlic in the pan. Fry for 2 minutes, add in chopped onions. Fry for 2-3 minutes. Add in all the diced vegetables and fry for a few minutes. Now make the sauce mix by mixing soy sauce, vinegar, salt, sugar and spices in a bowl. Pour this mix into the pan with frying vegetables. Stir the mix, add a little water if required. Now add tofu pieces into this sauce and stor again gently. Honey Chilli Potatoes At Home! Most Expensive Piece Of Art!